This is how we entertained ourselves for the Spring break far and away from home. Here we are in front of the tent. Spring break 2000 in Ardèche, France. For the spring break, we traveled down south to our favorite vacation country France. For many years in a row, we have been going to France, and still enjoy it. The country reveals a wide range of landscapes: beach, mountains, wine valleys, big cities. From Gouda it took us about 14 hours by car to reach our camp-site, but the long drive was certainly worth it. The kids have really gotten pretty good when it comes to traveling long distances. We left home at five in the morning, and to our pleasant surprise we arrived early in the evening at a secluded spot in the ragged hills next to a small creek. The nearest village was more than 8 kms down the narrow path along a winding road which followed the creek. It was a bit chilly when it got dark, but the clear night sky provided us with a magnificent view of the many starry constellations. 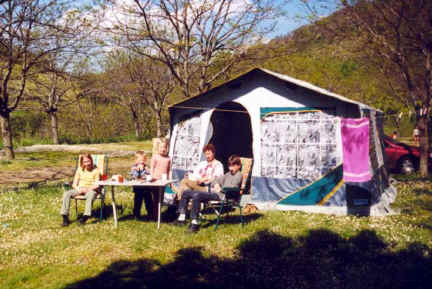 Camping in our trailer tent is a blast, and the kids enjoy being in the natural environment. As long as the weather is okay, camping is a great way to escape into nature. Typical scenic view during our walks. In the mornings we have breakfast: du pain, éclair au chocolate, and of course, the most fantastic croissants. Even the instant coffee was invigorating. One day we drove up stream and took a walk along some old abandoned railroad tracks. 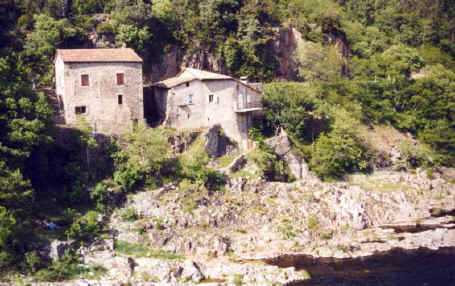 As we walked along the water, we discovered a number of interesting medieval villages and old stone buildings. The picture on your left shows one of those places. 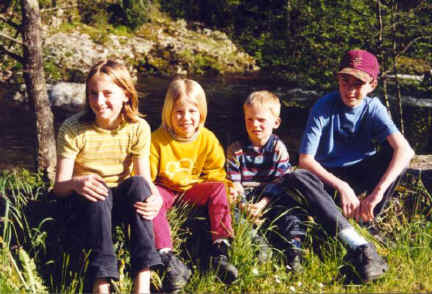 The kids in front of a small creek near the tent. Activities included visiting nearby villages, lighting the candles in the church (which has been our yearly tradition during all vacations), eating out and having so-called French pizzas, and taking lengthy walks in the ragged hills in search of great views and impressive waterfalls. Actually, as we were in the middle of the hills, we did not have to wander far. Lennart and I once took a hike, where I got stuck in three huge thorn bushes. Down below our tent, the icy stream could be enjoyed, lying in the sun, listening to the trickle of water and reading a book. The kids went fishing and even caught some frogs and a water snake! "My dream in life is that when I retire I will own and run an old farmhouse somewhere in the heart of the Ardèche." "Everybody gets so much information all day long that they lose their common sense..." - - Gertrude Stein. Just your regular down-to-earth kind of person who spends most of his time pursuing a pseudo-balanced life in the best of all perfect worlds. While you are here, be sure to check out my future-famous web log called Gibberations. I think you just might enjoy it (alot). Here are the links to every page within my homepage. Prove you were here and tell me what you really think. You can either sign my guestbook or just have a look. Feel like discussing something or other? Then perhaps it is high time to visit my forum and become part of the movement. Here are a bunch of sites outside my homepage which you might find interesting. In one way or other the following deserve some kind of credit for making this fine web site what it is today.